The location of the windfarm. 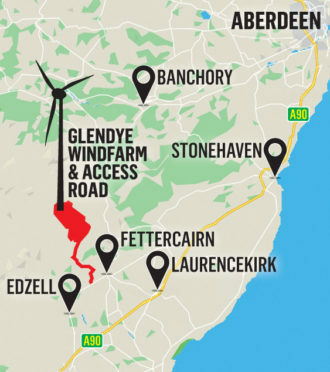 Communities have until the end of the day to make their voices heard on a proposed 26-turbine Glendye windfarm in Aberdeenshire. Developers Coriolis Energy submitted an application to the Scottish Government for permission to work on the expansive wind energy project last month. Concerns have been raised that the onshore windfarm, which has been earmarked for construction north of Fettercairn, would have a negative impact on the natural environment and goes against Aberdeenshire Council’s local development plan. However, Coriolis and partner developers ESB – an Irish energy company – believe the location would be suitable for generating environmentally-friendly electricity. They have also highlighted the benefits that would be made available to the local community through cash grants. The developers believe that by offering cash for community causes at the rate of £5,000 per megawatt, per year, over the 30 years the windfarm could be in operation, some £15.6 million could be made available for local projects. Sam Wylde, spokeswoman for the Save Clachnaben, Stop the Glendye Windfarm group and member of the Feughdee West Community Council (FWCC) , said some local residents fear the turbines could be too close to the popular walker’s hill of Clachnaben. She added: “We have had a lot of support over the past few weeks as a lot of people believe this is against the Aberdeenshire Local Development Plan. “Another concern is the peat that will be disturbed, which could result in flash flooding in the River Feugh. “There are also golden eagles and hen harriers that nest within just a few miles of the proposed site. James Baird, development manager for Coriolis said: “It is vital that local residents and all those with an interest in the wind farm have all the information at hand to make an informed decision. “It is important to note that no turbines would be located on Clachnaben. The closest turbine is 4.7 kilometres (2.9 miles) from Clachnaben. A Scottish Government Spokesman said: “The application for Glendye Wind Farm was submitted to the Scottish Ministers by Coriolis on October 2 and a wide-ranging public consultation is now underway. “Aberdeenshire Council, as planning authority, is a statutory consultee in this process. Community opinions on the development can be emailed to representations@gov.scot.